When Thanksgiving comes around, the one dish my kids start requesting that I make is my mashed sweet potatoes with sage brown butter. I’ll be honest, I’ve never enjoyed mashed potatoes. I’ve got issues with textures apparently and thus mashed potatoes were something I completely ignored. One year, I was making most of the Thanksgiving side dishes and so I had to make mashed potatoes. I decided we needed to broaden our horizons and switch things up a bit so we gave mashed sweet potatoes a try. Sweet potatoes are amazing because that are full of antioxidants, fiber, beta carotene, potassium, folate, and vitamin C.
Let me tell you, these sweet potatoes are amazing! Okay, so I still have a texture issue but these taste so good that even I will try to eat them! Loaded in delicious brown butter and sage, this is the perfect side dish for Thanksgiving but you’ll want them all year long! If you’ve never had brown butter or perhaps just never made it yourself, let me assure you that it is amazing and definitely worth the few extra steps. Plain butter is great but brown butter is on another level when it comes to taste buds! Then you add in sage and yum! Oh and one tip: Do not throw away the sweet potato skins! Since you roast the sweet potatoes skin and all, the potato skins remove very easily. The skins are not used in the recipe but you do not want to just toss them. They taste like candy! That’s right candy! I put all my sweet potato skins in a bowl and by the time I had finished the recipe, my family had devoured them. 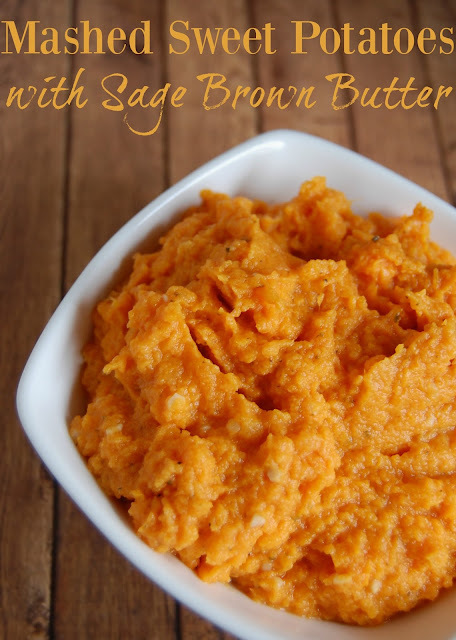 Not a mashed sweet potato fan? I get it! Try these roasted sweet potatoes with sage. They are very similar but without the mashed texture. Wash and dry sweet potatoes. Coat the sweet potatoes in oil and place on a baking dish. Sprinkle minced garlic on top of sweet potatoes. Cover and place in oven for 1-1.5 hours. Remove when tender and allow to cool. In a small pan, melt butter over low-medium heat. Once butter has melted add in ground sage. Reduce to low and cook until butter has browned. Peel sweet potatoes (this is incredibly easy to do once roasted). Place peeled sweet potatoes into a large bowl or pot. 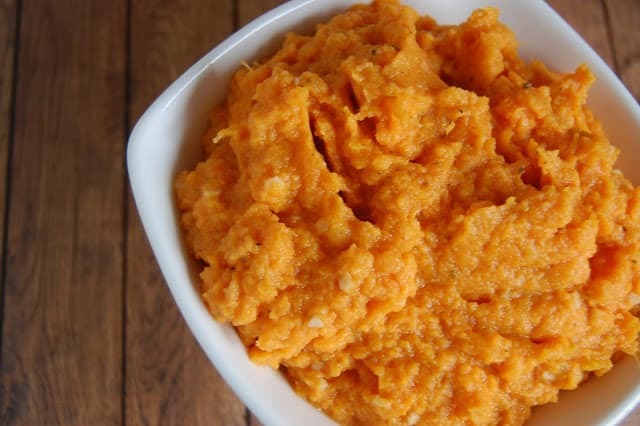 Mash the sweet potatoes using a potato masher or electric mixer. Add in the sage brown butter as you mash. This is so delicious!! I love sweet potatoes!! Thanks so much for partying with us at the DIY Crush craft party on Thursday!! I just pinned this! Mmm this sounds delicious! I love the flavor combo! Thanks for sharing this with us at Savoring Saturdays linky party. Hope you'll come back and join us again. I love sweet potatoes any way I can make them. Last Thanksgiving I made smashed sweet potatoes and they were great – I used a recipe very close to yours. Thanks for sharing on Real Food Fridays. Pinned & tweeted. Have a healthy happy blessed Thanksgiving. Now I like sweet potatoes, but it was the sage that intrigued me. I never knew that sweet potato skins could be enjoyed that way! I love all things sweet potato! Yum! I'm the only one left in my family who can eat sage, and I may just have to make up a separate batch of mashed sweet potatoes just for me. I want to gobble these up! This looks delicious! I’m featuring it tomorrow night on Allergy-Free Thursdays. Can’t wait to see what you share this week!